(Z suffix part numbers) to fine tune your Subaru suspension to your liking !! Adding a stiffer rear swaybar helps to rid your Subaru of it's inherent understeer problem!! Corner turn-in is noticeably faster with much better transient response. If you uprate the front suspension then it is recommended to further uprate the rear suspension. Example, uprate the rear suspension to 22mm Whiteline ARB and you reduce understeer and increase turn in. Uprate the front ARB and you will increase understeer unless you either uprate the rear to 24mm or set the adjustable front ARB (where blade adjustable front ARB is available) to soft and set the adjustable rear ARB (where blade adjustable ARB is available) to hard setting. We recommend adjustable front and rear Whiteline antiroll swaybars. Increase the rear sway bar size to neutralise understeer. Increase the front sway bar size to neutralise oversteer. Increase rear then front bar size to fine tune handling behaviour. Increase front then rear bar size to neutralise understeer. 2 point adjustable - simply add 1mm for extra (stiffer) hole position. Example - Upgrading from an 18mm factory bar to a Whiteline 22mm 2 point adjustable sway bar results in a 123% (soft) and 167% (hard) increase in torsion rigidity. (Refer blue highlight in chart). 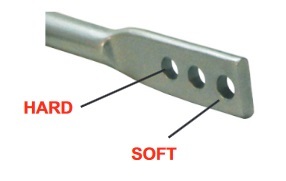 3 point adjustable - simply subtract 1mm for soft setting and add 1mm for hard setting. 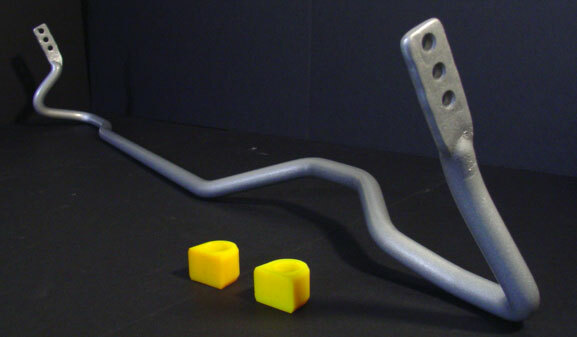 Example - Upgrading from a 20mm factory bar to a Whiteline 24mm 3 point adjustable sway bar results in a 75% (soft), 107% (standard) and 144% (hard) increase in torsion rigidity. (Refer green highlight in chart). 4 point adjustable - simply subtract 1mm for soft setting, add 1mm for intermediate setting and an additional 1mm for hard setting. 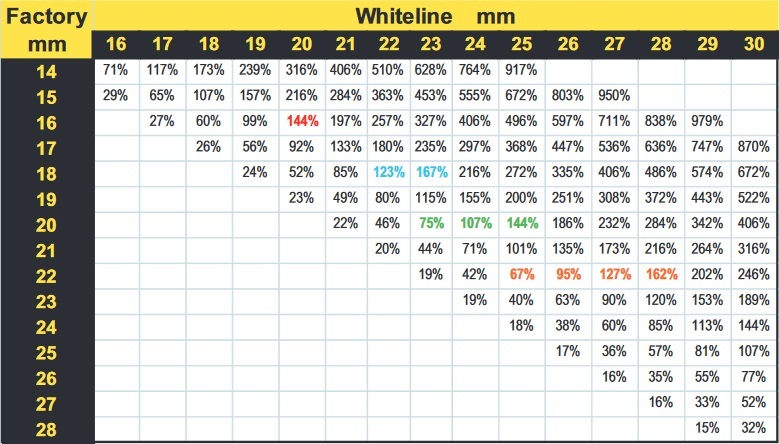 Example - Upgrading from a 22mm factory bar to a Whiteline 26mm 4 point adjustable sway bar results in a 67% (soft), 95% (standard), 127% (intermediate) and 162% (hard) increase in torsion rigidity. (Refer orange highlight in chart). The information on this page is taken from information provided by Whiteline and no accuracy can be guaranteed. Note - we are not pushy sales oriented people, however with respect to significantly larger rear swaybars, the forces you exert on your stock swaybar mounts with these much larger bars is more than Subaru originally engineered the mounts to withstand. 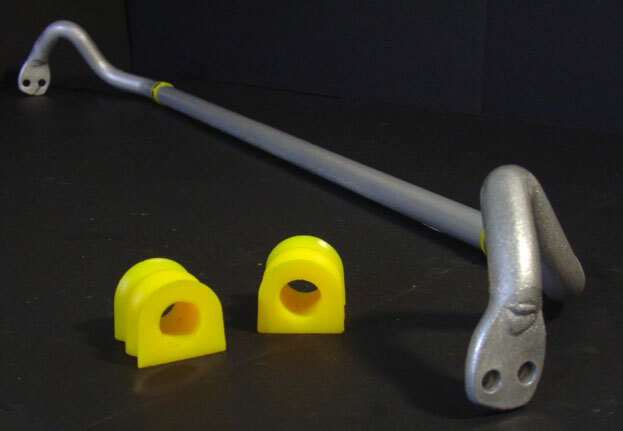 Therefore we do recommend upgrading your swaybar mounts when you upgrade with the stiffer rear bars.